Argentinian bluesman Daniel De Vita has a firm grasp of Chicago blues history and draws inspiration from the late Chess Records, the label that pumped out hits from 1950 through 1975. You will get the drift after you see the artwork he chose for his debut CD, Southside Blues, which features a disc that looks like an old Chess 45 record label, and the campy “MONO/STEREO Compatible” tag emblazoned on the album cover. And then when you listen to the record you will find 15 classic blues tunes within, all of them recorded with the same technology as they used in the 1950s at Chess. With this kind of build-up Daniel had better deliver the goods and he certainly takes care of business here; he is a pretty darned good singer and guitarist even though he has only been in the blues scene for ten years. This 27-year-old from Buenos Aires has a voice beyond his years, and for extra help in the studio he recruited Mariano D'Andrea on bass, Gabriel Cabiaglia on drums, and ace Nicolas Smoljan on harp. Things get rolling with “You Got Me Where You Want Me” by John Brim, the first of many Chess artists that are featured on this disc. De Vita got the 50s sound he was looking for, as there is a definite low-fidelity to the proceedings, and everything is a bit muted (it is in stereo, though). The band sticks fairly close to the original arrangement with D’Andrea’s woody-sounding double bass kicking it off along with lightly honking harmonica from Smoljan. Daniel’s voice is a thin and aged tenor with a decidedly American accent, and the group totally nails the vintage vibe. The group also takes on Brim’s “Be Careful What You Do,” which has a little more of a modern electric blues sound to the guitar, though the authentically disjointed style of the solo is definitely a throwback to a different time. Little Walter made the cut for Southside Blues, too, and he is well represented by “One of These Mornings,” a rolling 12-bar blues song with a tasteful guitar solo, and but no harp solo, which is a bit surprising for a Little Walter song. The other Little Walter tune was written “Baby Face” Leroy Foster, and “Red Headed Woman” gives Smoljan a little more room to step out on his harmonica. You will also find a pair of songs from the famed Chicago pianist, Sunnyland Slim: “Farewell Little Girl” and “Be Mine Alone.” The latter is a rocking good time, with the electric guitar more forward in the mix, and a groovy harp solo that is so distorted at times that it is hard to tell if it is a harmonica or a muted trumpet. It does seem odd to hear this song with no piano, though. This song is the closer, and it is surely a fun way to end the set. Interspersed among the eleven electric blues tunes are four rootsy acoustic tracks. One of these is Willie Dixon’s “Good Advice,” which brings in guitar and backing vocal harmonies courtesy of Gabriel Gratzer. This tune is catchy with a cool jangly guitar outro, and at only three minutes it is just not long enough! Also from Willie Dixon is “Violent Love” with Mauro Diana on guitar and vocals. There is a real distant quality to the way the vocals are recorded on this one, giving it an old-time radio feel. Daniel also has a run at Robert Johnson’s “Walkin’ Blues” with only his resonator guitar and guest artist Damian M. Duflos providing the harp and vocals. The standout of these bare-bones tracks is “Poor Black Mattie” by R.L. Burnside, because it is a great song and Daniel also does a stand-up job of making the complicated guitar parts work while not taking the tune out of its original context. 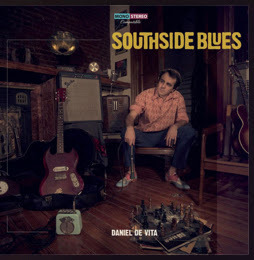 With its unique recording style, Daniel De Vita’s Southside Blues is a niche recording, but it is very appealing. 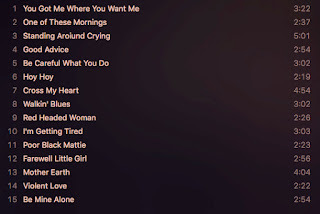 Fans of old Chicago blues should be pleased with what they hear on this disc, as besides the aforementioned artists it also includes cuts that were originally done by Muddy Waters and Little Johnny Jones. A big question is, “What is next for Daniel De Vita?” Hopefully the answer is that he is writing some original music to record, as he has the blues running through his blood, and his youth and work ethic can provide a new voice and sound for a timeless music genre. I mostly use powered speakers for gigs, as I really love my QSC K10s and K12s, but for smaller gigs sometimes it is easier to not have to run extension cords to the speakers, so there is still a place in my world for passive loudspeakers. This is where the Yamaha A12 PA speakers come into my story. The Yamaha A12s are 2-way passive speakers with a 12-inch woofer and a 1-inch diaphragm titanium high-frequency horn. I have no idea what the cabinets are made of as they are covered with fuzzy black carpet, but at this price point I suspect they are made of MDF. They are relatively light at 35 pounds each, and thy measure 16 x 23 x 13 inches. There is only one handle on these, a recessed unit on the top, so they are not entirely easy to wrestle onto speaker stands. Spec-wise, they are 8 ohm speakers that are rated at 300W continuous / 500W peak, with a frequency range of 65Hz-20kHz, and a maximum of 125dB. Around back you will find ¼-ich and Speakon jacks, and not much of anything else. I run the A12s with my old-school 500-watt Yamaha EMX512SC mixer, and they are certainly up to the task. They have a warm sound that I cannot really get with the QSCs, and they provide surprisingly good bass and mids for 12-inch speakers. And, of course they get plenty loud without distorting - I consider Yamaha to be a solid brand, and these speakers meet my expectations every time. The Yamaha A12 loudspeakers sell for around $230 each from most online sellers, and they are a great deal. They sound good, have good power output, are durable, and will get the job done. Why kick a winner? When is the last time you heard a blues album from Finland? 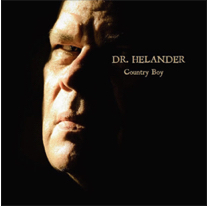 Well, Country Boy from “Dr.” Ilkka Helander is a rare set from the land of a thousand lakes, and it is a fine collection of hard-hitting classic acoustic blues. The Dr. has previously released three albums of mostly original electric blues, so this unplugged album is a big departure from his proven methods as it has ten covers and only two originals. But, apparently this man knows the blues in all of its forms, and this disc really clicks. For this project, Helander sings and provides the most of the acoustic guitar parts, and Mika Railo joins him on double bass for many of the tracks with Topi Kurki behind the drum kit on four songs. There are also a few outstanding guest artists, as you will soon see. The Muddy Waters-penned title track is up first, which features none other than Grammy winner Charlie Musselwhite on harmonica, and Esa Kuloniemi on slide guitar. “Country Boy” is an awesome song to start with, and this crew does this slow blues jam justice with Muselwhite leading the way along with the doctor’s hearty vocals. In case you were wondering, the vocals are all in English, with appropriate inflections and a touch of gravelly Midwest twang. If you like Muddy Waters, there is one other tune from his Folk Singer album on this disc, “My Home is in the Delta.” Like many of the other songs on this release the instrumentation is kept to the minimum, this time with just Helander’s acoustic guitar and Railo’s stand-up bass. He dials things back even further with Son House’s “Walking Blues,” with only his voice and dobro. Mr. Helander has a nice touch and feel on the six-string, and he does a pretty mean job with his slide on this one. There is also a pair of neat Junior Wells tracks to be found on Country Boy: “Good Morning Little Schoolgirl” and “Hoodoo Man Blues,” both of which feature Little Willie Mehto on the harp. His style is a little more laid back than Musselwhite’s, which allows Helander’s voice to take the front of the stage and he does a marvelous job of howling out these tried-and-true lyrics. A standout track on this disc is Charley Patton’s “Green River Blues” which has quite a bit going for it. Kurki lays down a slick up-tempo drum rhythm that meshes well with a walking bass line provided by Railo. Also, Kuloniemi’s mandolin is a cool counterpoint to Helander’s well-picked guitar. Of course, it also helps that this is just an incredible song that was written by a blues master. There are plenty of other cool classic blues covers to be found here, including “Mean Old Frisco” by Big Boy Crudup, Lightnin’ Hopkins’ “Hello, Central, Give Me 209,” and Little Walter’s “Just a Feeling.” But as wonderful as these songs are, there is one song that is a little outside the box, and that would be Mike Bloomfield’s “Hey Foreman.” This is probably the newest of the covers (from the mid-1970s), and its original folk blues would have seemed a little out of place if Helander copied it exactly. But he re-worked it with slide guitar from Olli Haavisto, making it a little more Delta than Bloomfield’s version. It works, and it integrates seamlessly with the rest of the songs on the CD. Helander and Kuloniemi wrote one of the two original tracks on the album, and “$100 Bills” fits right in with the rest of the set. This tune has a driving roadhouse beat with Musselwhite adding his harmonica and Kuloniemi picking his mandolin. This is a very well written track, and is the standout track on the album. The other original, “Big Cold Beer,” also cuts the mustard with its jaunty guitar leads and witty lyrics. Hopefully we can get a full album of original blues from Helander, as he certainly has the writing chops to pull it off. Dr. Helander did an impressive job with his first acoustic blues album, and Country Boy is a winner. It is a cool history of the blues greats, played with respect and talent, and it is not a record you will listen to once and put away. Check it out for yourself, and also take a listen to his catalog of original electric blues if you get the chance. This fellow is the real deal!